Canopy began with the work of biologists and botantists in Central America who needed to ascend and study the flora and fauna of the upper canopy of the forest without damaging or affecting the environment. 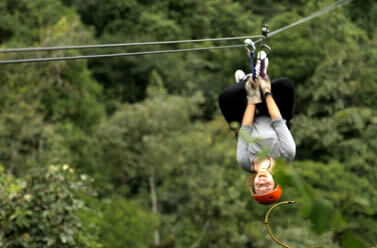 This same system has been implemented as a model to develop ADVENTURE canopy tours. Canopy tours are adventurous excursions for the whole family that provide a way to discover the forest offering the incredible sensation of flying though it while observing astonishing landscapes that would be impossible to experience from below. Getting equipped consists of putting on harnesses, helmets, gloves and pulleys. Once everyone is equipped we move on to the demonstration and explanation by the guides. Begin the tour on 10 different cables covering 2.650 mt. 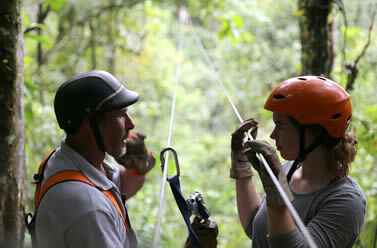 (8,694 ft.) always accompanied by two trained Mindo Ropes & Canopy guides. During the tour the guides will show us the diversity in flora and fauna that exists in the cloudforest such as the famous toucans that fly from one side to another during the tour. On the hikes between the cables we will be able to observe orchids, bromeliads, anthuriums, vines and an unforgettable landscape that you can only appreciate while on the tour. Begin the tour on 2 different cables covering 1000 mt. 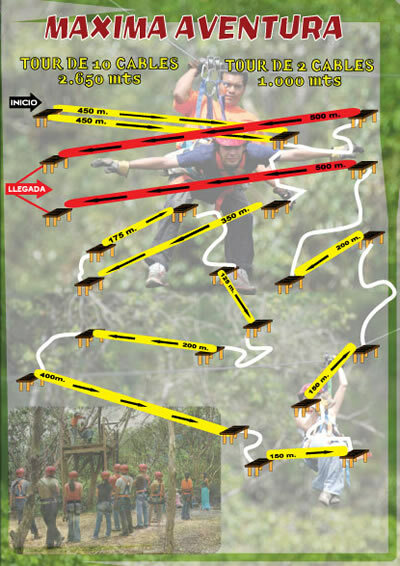 (3281 ft.) always accompanied by two trained Mindo Ropes & Canopy guides.